We are a precision components manufacturer in Springfield, Ohio that serves clients across the globe. At Esterline & Sons, customer service is not a department – it is everyone’s job. Esterline & Sons Manufacturing was founded in 1957 by Waldo and Dale Esterline. Waldo Esterline, while working for a local instrument company, perfected a process for manufacturing precision stainless steel closed-end tubes for thermistor and other temperature sensing devices, and he started Esterline & Sons to provide those thermistor housings to his previous employer. Over the years, Esterline & Sons has grown into an 18,000 square foot state of the art facility, providing customers around the world with precision components essential for Aerospace, Medical, and Sensors grade applications, among other industries. In 2016, Esterline & Sons was purchased by Waldo’s great nephew, John Maurer, and Plant Manager Mike Stollings. Maurer and Stollings have 50 years of combined experience in management of the company and plan to continue its growth and commitment to outstanding customer service. Esterline & Sons is still located on part of the original 160 acre Esterline farm settled in 1890 in Green Township, Clark County, near Springfield, Ohio. And, the average tenure of an Esterline & Sons employee is 15 years bringing a wealth of knowledge to everything we machine. 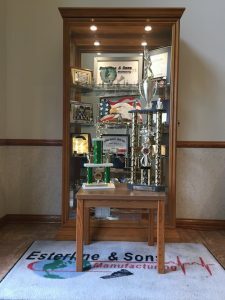 Visitors to Esterline & Sons are greeted by an array of “thank yous” from all over the community, from youth sports teams (Esterline & Sons sponsors numerous little league baseball, youth soccer and recreational softball leagues every year) to local nonprofits. During the week of the Clark County Fair, CEO John Maurer can be found strolling through the barns, supporting the local 4-H and FFA projects. 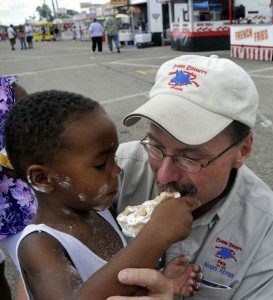 John was featured in a Springfield New-Sun article (Aug 2009), when he retired from the Clark County Fair Board after serving 20 years. “My favorite parts of the fair are anything that involves the kids, or anything that makes them smile,” Maurer said. “I’ve been involved with the fair my entire life. About 35 years ago, I participated in the calf scramble. As a youth, the 4-H and FFA programs were good for me developmentally. So I’ve wanted to try to make it the best possible fair for everybody else. I really want to get urban kids involved more with the fair,” Maurer said. 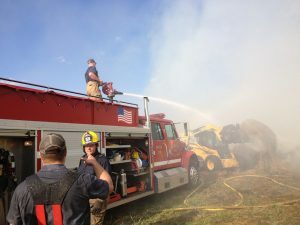 Esterline & Sons Manufacturing is serving the community in another very special way, by having several volunteer First Responders on staff. 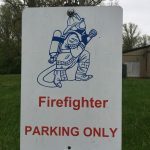 Our First Responder staff members receive special parking and are able to leave for an emergency to serve our community. Esterline & Sons recognizes and applauds the significant contributions these volunteers make to the community.